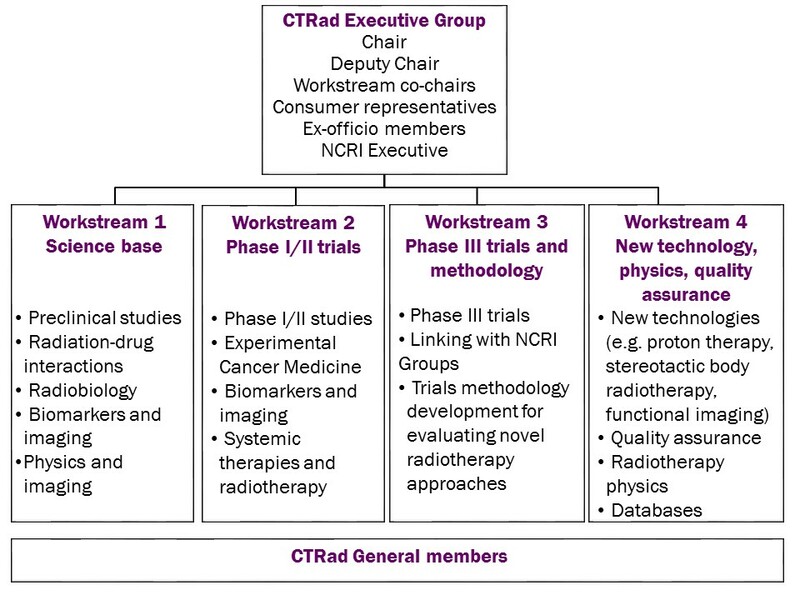 CTRad is made up of an Executive Group and four workstreams, each bringing together experts from the different disciplines involved in radiation-related research. The Executive Group oversees the individual workstreams and leads on cross-cutting initiatives such as training and workforce development. They meet up to ten times a year by teleconference and up to twice a year face-to-face. The four workstreams focus on different aspects of radiotherapy research; they meet all together at least once a year, and individually two to four times per year, often by teleconference. CTRad also has general members who are individuals working within or connected with the UK radiotherapy community. All of CTRad’s members are committed to developing inclusive, UK-wide approaches to radiotherapy and associated radiobiology research.